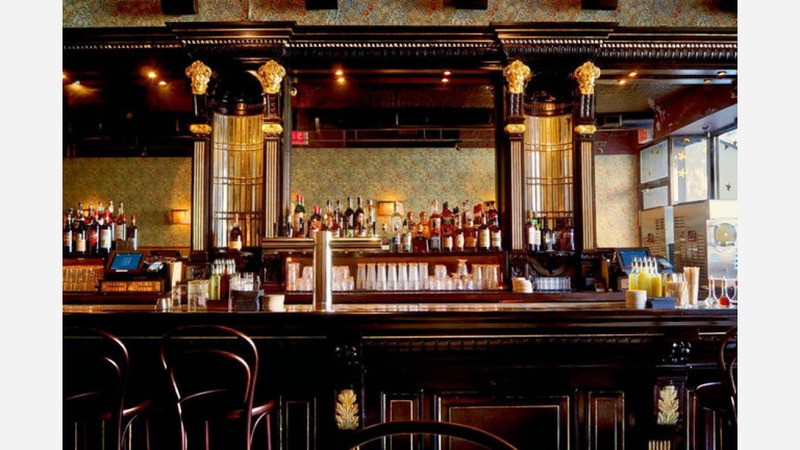 Want to check out the newest beer bars in New York City? You're in luck: we've found the freshest establishments for draft, canned or bottled brews. 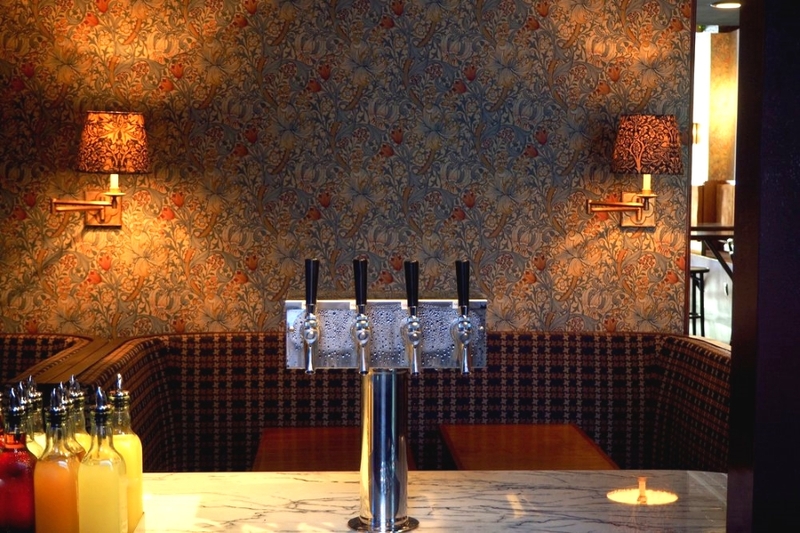 Here are four top places to check out the next time you're in search of a pint. Stay Gold is a cocktail and beer bar featuring an outdoor garden, from Matt Piacentini and Chaim Dauermann (the team behind Greenwich Village's Up & Up). With six beers on draft, including a Montauk Driftwood Ale and Founders All Day IPA, and another seven available in can form, bar-goers will find plenty of brews, as well as bites like togarashi popcorn and brussels sprouts with almonds, lime, palm sugar and Fresno chili. With a four-star Yelp rating out of five reviews, Stay Gold has been getting positive attention. Yelper Scharvin W., who was the first to review Stay Gold on July 11, wrote, "Nice setting. Lowly lit, calming ambience. Kitchen is open until 2 am unlike most bars in the area. It's bar snack food but the little burger got me past any potential inebriation." Erica M. noted of the house signature drink: "The Stay Cold -- it's a slushy-bourbon-IPA drink -- I don't like bourbon and don't drink craft beers, but I liked the drink -- it was ginger tasting and refreshing." Stay Gold is open from 5 p.m.-3 a.m. daily. Dive 106 is a beer bar offering burgers and more. Located at 938 Amsterdam Ave., it is the sister establishment to Dive Bar, Dive75, and Broadway Dive by Lee Seinfeld. The beer selection includes cans of Shiner Bock, as well as a diverse array of craft beers on tap. On the food menu, check out offerings like the grilled salmon salad and kimchi turkey sliders. With 4.5 stars out of seven reviews on Yelp, Dive 106 has made a strong start. Scott L., who was the first to review the new bar on June 20, wrote, "This local chain group of "dive bars" are interesting in that they capture that down home spirit, are basically clean (you won't feel like you'll get fleas) ... but with mod cons like big screen TVs and a very good beer selection." Yelper Taylor O. wrote, "Dive 106 has a diverse craft beer list, delicious food choices and the staff at this location are by far the friendliest of all of the locations." 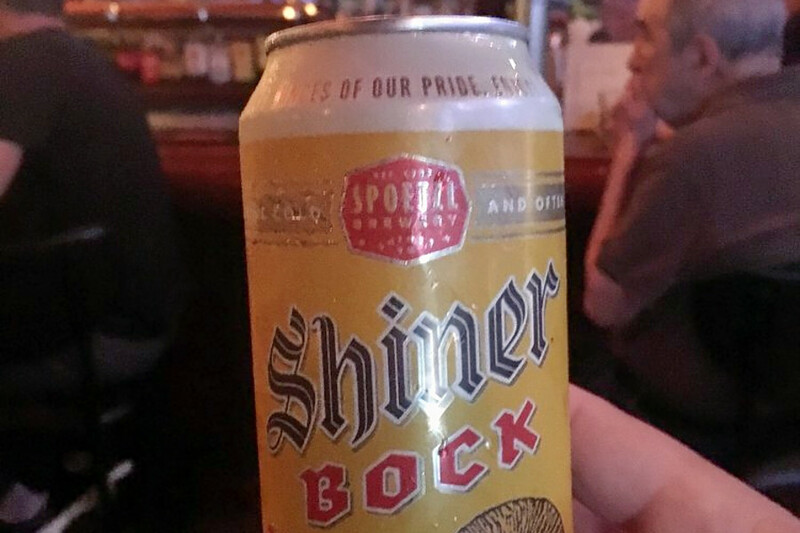 And Yelper Heather S. added, "Texas friends: They have Shiner!" Dive 106 is open from noon-4 a.m. daily. Fulton Hall is a pub and sports bar offering beer, cocktails and bar bites from its space in the Gotham Market at 250 Ashland Place in Brooklyn's Fort Greene, as we recently reported. The sixteen beers on tap include the Allagash White and Bell's Two Hearted IPA, while the Beer and a Shot deals include a half-pint a of Guinness with a shot of Paddy's. From the food menu, expect to find vegetarian versions of classic bar bites like buffalo wings (buffalo cauliflower), alongside more upscale options such as arancini with nduja and provolone; cacio e pepe mac and cheese (rigatoni with Parmesan, black pepper and breadcrumbs); and the Impossible Burger topped with cheddar, American cheese, pickles, special sauce and onion. Yelp users are excited about Fulton Hall, which currently holds 4.5 stars out of 17 reviews on the site. Yelper Emmett S., who was one of the first to review the new bar on June 8, wrote, "This is probably my favorite sports bar in NYC. Just opened up. Good for big games as well as hanging out. The Impossible Burger heads up an awesome selection of vegetarian options to go with great burgers and wings." 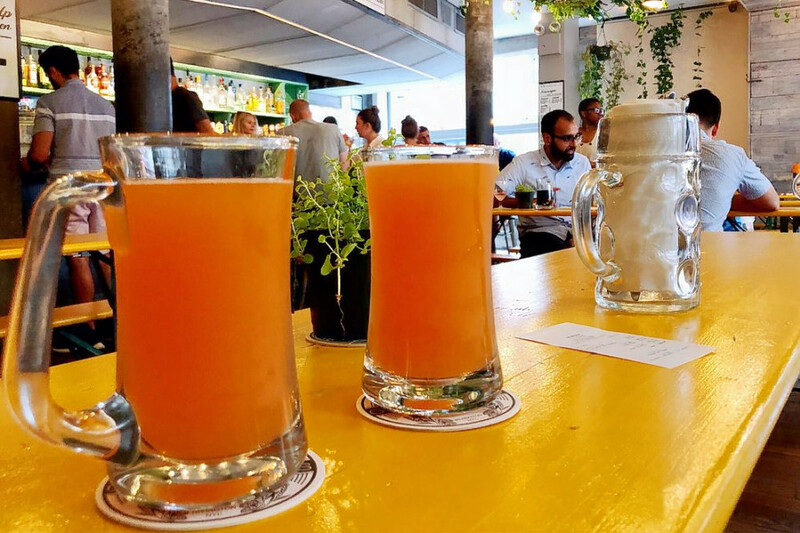 "Comfortable with good drinks, friendly service, and dope vibes," Yelper Noah B. added. "I might even schlepp from Manhattan to have those vegetarian cauliflowers wings again!" Fulton Hall is open from 11 a.m.-midnight Sunday-Thursday and 11 a.m.-2 a.m. on Friday and Saturday. Grunhaus is a German beer bar and restaurant now open in the former space of Spitzer's Corner at 101 Rivington St. on the Lower East Side. The rotating selection of 30 beers on tap (plus more in cans and bottles) includes German-origin offerings like the Kostritzer Schwarzbier, an easy drinking black beer. (You can check out the full drinks menuhere.) But diners should be aware: the joint is card-only -- no cash. Grunhaus seems to be a welcome addition to the neighborhood, with 4.5 stars out of 17 reviews on Yelp. 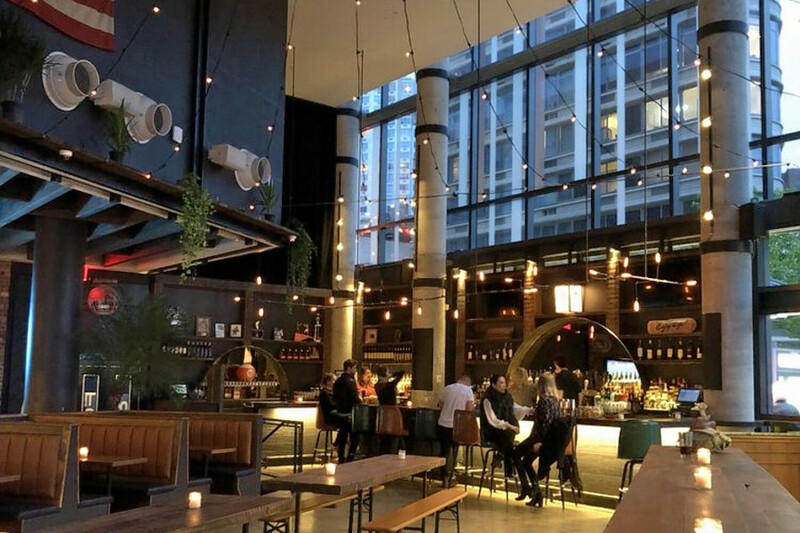 "Grunhaus features a bright airy vibe with open windows that make you feel like you are sitting outdoors while mostly still inside," wrote Yelper Renee G., who reviewed the bar on May 14. "The brunch deal which includes eggs, sausage and a bloody for $12 is worth coming back for." And Yelper Carmen W. cheered, "'Ale' yeah! This place is awesome. Lots of games around to play while drinking. The music selection here is great as well." Yelper Deana B. added, "Grunhaus has a solid selection of yes, beer, but also wine and cocktails as well. Everything is reasonably priced too. The music isn't overly loud and lastly, the atmosphere is casual."